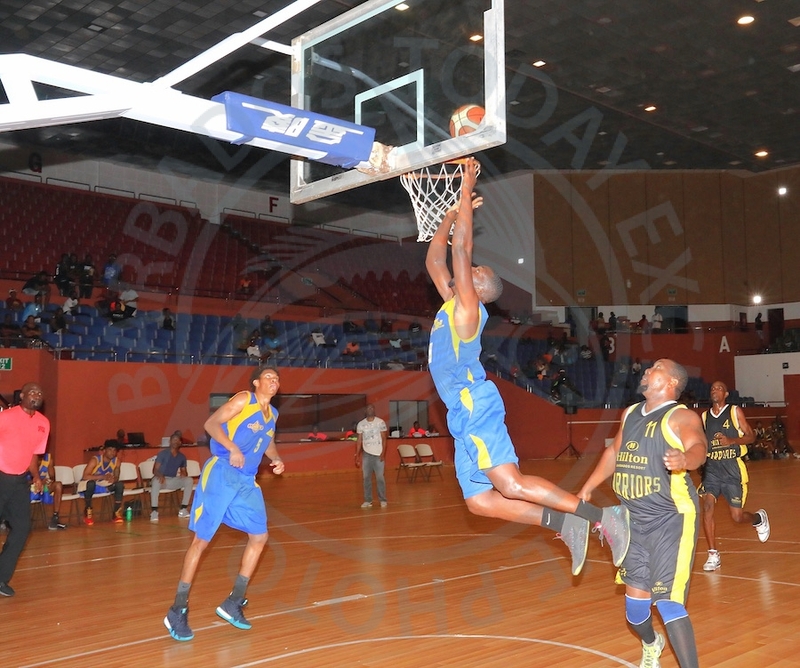 Reigning kings Barbados Lumber Company Lakers won game three last night against Warriors 78-74, and now have a 2-1 lead in the Co-operators General Insurance Barbados Amateur Basketball Association’s best of five series final. Played at the Wildey, St Michael Gymnasium, a sterling effort by center Nicholai Williams with a game-high 24 points for Barbados Hilton Resort Warriors Sports Club proved futile, as the Francis Williams-coached Lakers overcame an 18-18 tie in the opening stanza to dominate the second and third 41-33, 61-45 en route to a hard-fought four-point victory. It was a good showing by the six-footer Williams with ten two-point shots and four free throws, inclusive of 18 rebounds with ten on the offensive end, in close to 32 minutes on the court. So impressive was Williams that at one stage during the game he went big over the head of the professional John Jones [20 points for the victorious Laker] and made that floater look so easy. In fact, Williams enjoyed it so much he gestured with his right hand to Jones – “you can’t see me”. Warriors led by Williams fought relentlessly to get back in the game having been down by an 18-point deficit (41-59) coming onto the end of the penultimate quarter. National small forwards Justin Pile with a contribution of 15 points and Jamar ‘Spanner’ Headley 13 assisted in that fight. However, Headley with a total of 16 rebounds and Pile did not take the attack to Lakers as they did during game two last week when they came from behind to level the series 1-1. Warriors point guard Tramaine Shaw made it into double figures with 13 points while Ricardo Toussaint, Kevin John and Shaquan Newton scored four, three and two points respectively. Nicholai Williams (left) of Warriors tries to intercept a drive by national small forward Mark Bridgeman of Lakers. With seconds left to play, Williams with a lovely steal from Lakers captain Keefe Birkett scored a layup to cut the deficit by one [73-74] with 16 seconds left to play. Warriors and their coach Frederick Bynoe needed that recharge to stay alive in the game and forced Lakers bench to call timeout. The defending champions had possession shortly after and unfortunately for the Warriors, Pile fouled Lakers ace shooting guard Birkett who nailed both shots which widened score by three [76-73] with 13.8 seconds to play. Pile went for a three-point shot that just missed. In the process of that play, Lakers’ defence was found guilty by referee Rene Batson of committing a foul on Headley and he scored one of two free throws [74-76] to ensure Warriors stayed in the hunt. Nine seconds remained in the game and Warriors were still in with a chance but national forward Mark Bridgeman who had eight points in the game buried any hope the men in yellow and black had of tying the scores when he scored two free throw attempts awarded to him for a foul. That extended the lead by four [78-74], and that sealed the deal. Lakers will have their mind set on lifting the title tomorrow night when game four tips off at the Barbados Community College. Also adding to the overall total for Lakers were Birkett who scored 11 points. But it was Chiamaka Browne with 17 that had the second-best individual figures for Lakers. Ricardo Jemmott with a contribution of eight points, Jimal Singh with six and Andre Boadu and Ormond Haynes four each, also ensured they were on the score sheet.